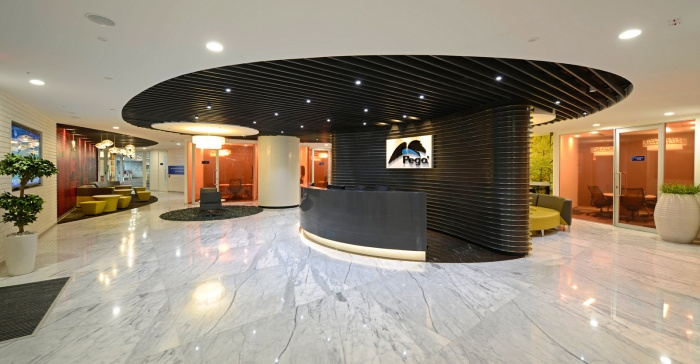 DSP Design Associates has developed a new office space for Pegasystems located in Hyderabad, India. The Pega office in Raheja Mindspace Hyderabad is a Global Facility with Indian design philosophy. The office reflects Pega’s Passion for great software, to be Engaging to its employees and customers, Genuine in its ability to reflect their culture and Adaptive as the company continues to grow rapidly in Hyderabad. In addition to being true to PEGA’s values, the office reflects vibrancy and excitement for its Indian heritage and allows for some fun to be mixed in with hard work. Suman Reddy – MD Pega India says – “we want people to be able to come and have fun and create great software. That is the fundamental thing”. The design undercurrent of the facility is inspired from the history of Hyderabad, its rich account of the Nizam era and culture. Traditional arts, local culture, kalamkari motifs, images and icons of Indian and Hyderabad architecture weave the concept together. Geetika Jain, lead designer of the project says – “there is a whisper of Hyderabad & India in the element of design of this office, yet it does not overpower its image of being a global & futuristic work space”. Therefore, flexible collaborative furniture, high-speed wireless connectivity and plug points in all parts of the office, seating options ranging from sofas to stools and office chairs and furniture that can be moved around for impromptu meetings are all ideas that emerged from the need for greater mobility and an “activity-oriented” office. Entire facility is spruced up with Work Cafes with coffee vending machines, a discussion table and video conferencing facility. This allows people to socialize on a global level, informally collaborate internally and exchange ideas. These areas are donned with very vibrant and warm graphics of Indian fabrics, kites, red brick cladding – all of which adds up to an old street charm of the alleys of Hyderabad. The Collaboration Hubs, planned generously around the workspaces are done up to be very inviting and user friendly. Each hub caters to a work team of 10 – 12 members and is planned close to their work space. Used for holding scrums with teams’ global counterparts, these spaces are geared with wireless VC equipments, and feature vivacious colors, patterns and lighting fixtures with traditional Indian designs. Pega system’s Hyderabad office is the perfect example of Global meets Local – a facility very Indian at its heart with global functionality apt for its multinational status.